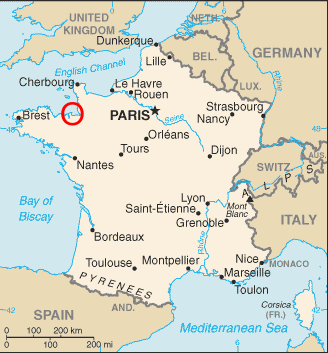 I started by traveling by ferry from England to Saint-Malo along the northeastern coast of Brittany. Saint-Malo was a busy shipping and pirate base in past centuries, and today it is a very busy passenger ferry port. After walking around the old city ramparts, seeing the enormous tides along that part of the coast, and staying in a small hotel along the harbor, I took a train to Pontorson. I'm on my way to visit Mont-Saint-Michel, an influential ecclesiastical center and a destination for pilgrimages since the early 8th century. The pictures and stories here are a composite of three visits to the area, the first (and the one in which I stayed in Pontorson) in late October of 2001. Now we're back to my 2001 London-to-Frankfurt trip. I got up at 0715 and was out on the street while it was still completely dark. I had paid in advance at the Hotel-Bar Cap-Malo, so I left the key on the bar and let the door lock behind me. In the 1840s the communes of Saint-Malo, Saint-Servan, and Paramé had all announced their desires to be connected to the railway network being constructed throughout France. This was formalized in the 1855 "Law on the Merger of the Normandy and Brittany Railways", which formed Compagnie des Chemins de Fer de l'Ouest or the West Railway Company. 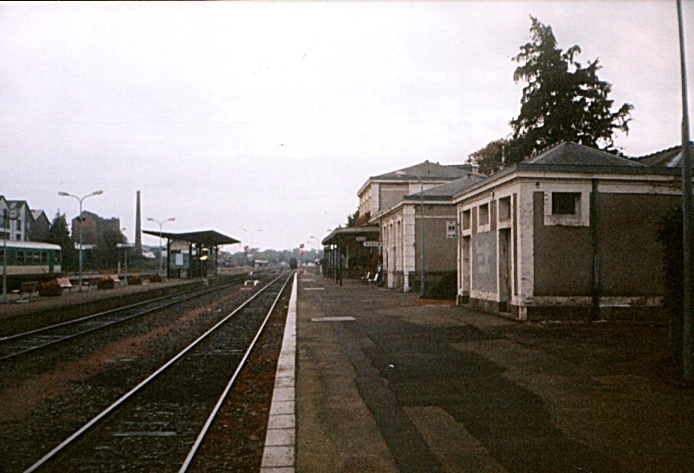 The line was completed from Paris to Rennes in 1858, and the branch from Rennes to Saint-Malo and Saint-Servan was built in 1860–1864. The two towns have grown together over the years so that today Saint-Servan is effectively the southern part of Saint-Malo. The Saint-Malo station was built in 1864 as the rail line was being finished. The line became part of Société Nationale des Chemins de Fer Français or SNCF in the 1930s. The picture here is from my visit in 2001. It shows the original station from 1864, and you can see that there is no overhead electrical line. It was diesel service only on this line. In December 2005 the line from Rennes to Saint-Malo had been fully electrified and high-speed TGV Atlantique service was established between Saint-Malo and the Montparnasse station in Paris. The TGV or Train a Grande Vitesse, literally the High Speed Train, can operate at speeds up to 150 kph between Rennes and Saint-Malo. That's fast but only half the full 300 kph of the main TGV lines. A new station was opened when TGV service started in 2005, 260 meters further away from the center. In October 2009 the old station was demolished to redevelop the area. By 2011 the new station was handling over one million passenger boardings per year. Regional trains of the TER Bretagne and TER Basse-Normandie systems also serve Saint-Malo via Dol-de-Bretagne, with significantly more service in the summer. The busy port of Saint-Malo also contributes a lot of freight traffic on the same route. The double cross hatches on the railway line on this map indicate that it's a multiple track line. This map of the northeastern Brittany coast shows the rail line running southeast from Saint Malo to Dol-de-Bretagne and then continuing east through Pontorson. The Bay of Mont-Saint-Michel is a large shallow area where the coast makes an almost right-angle turn to run north as the Cotentin Peninsula to Cherbourg. 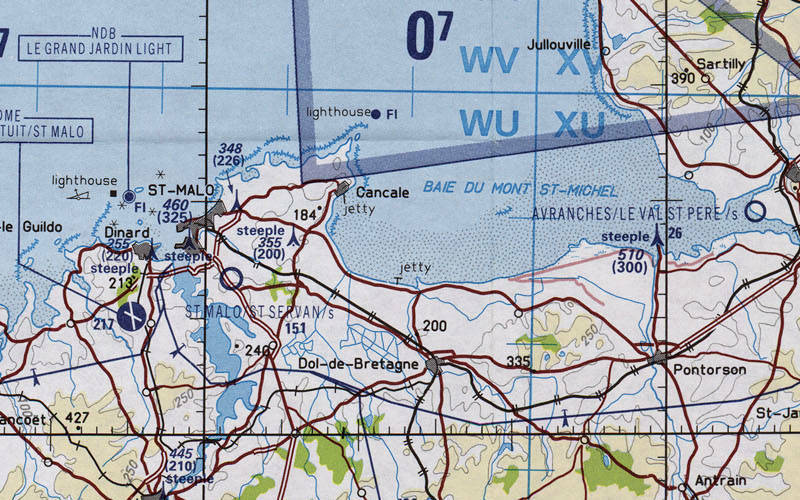 Mont-Saint-Michel is marked on this aviation map as "steeple" with its tip 510 feet above mean sea level and 300 feet above local ground level. Well, the tip is that high above mean sea level. Most of the surrounding ground is right at sea level, the mount itself is a steep cone rising abruptly out of a vast tidal flat. And, as we'll see, it's quite a bit more than simply a steeple. 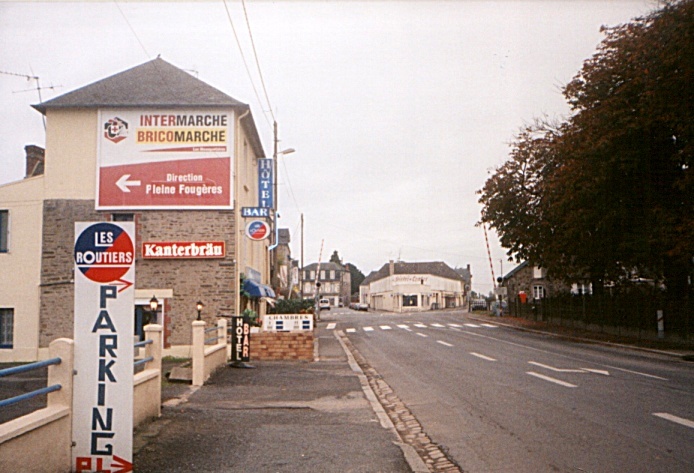 The town is about 10 kilometers from Mont-Saint-Michel. Its population is now around 4,100, down from a peak above 5,400 in the period 1975–1982. The Couesnon river has branched by the time it's this close to the bay, and its branches flow around the town which is surrounded by marshy land to its south and then further estuaries the rest of the way north to the bay. Pontorson, or at least its church, was founded in the 12th century based on a promise from William the Conqueror. The Notre-Dame church in town dates from then, showing its age with its extremely simple late Romanesque design of a barrel vault roof with a plain façade. The wall of the entry door is a simple wall, almost entirely planar and with no decoration. The roof of the nave is a half-cylinder, a shape formed by a simple surface curving around a single axis. It lacks the more complex shape of intersecting cylinders of following centuries, and the even more complex geometry of the Gothic era. Saxons came invading through here in the 400s AD. Local place names like Thumb and Thumb-lein go back to the Saxons. Then the Franks moved into the area. Saint Léonce was the first bishop of Avranches, the first town to the east up out of the swampy delta. He built churches in Caugé and Les Pas. Then three monks settled in Sacey and began Christianizing what they found to be the local pagans. After the Council of Orleans in 541, the churches in Caugé, Boucy, Les Pas, and Moidrey organized parishes and a priest settled in each one. Jumping ahead to June 1944, engineers of the IX Engineering Command of the U.S. Ninth Air Force began constructing a combat Advanced Landing Ground or ALG outside the town soon after the area had been liberated after the D-Day landings. The ALGs were temporary advance airfields, often of improvised construction. There would be an access road connecting to the existing road network; an area to store fuel drums, ammunition, and other supplies; and a minimal electrical system to run the needed communications systems and lights. Tents were used in place of permanent structures. As the front moved east the airfields in the rear were shifted to supply operations or other support uses, or were simply abandoned. The Pontorson Airfield became operational as A-28 on 10 August 1944. It had a single 5000 foot (or 1500 meter) runway aligned 08/26, constructed from Prefabricated Hessian Surfacing over Compressed Earth, "3600 PHS/1400 ETH" in the nomenclature of the time. The British had developed Square-Mesh Track, heavy wire joined in three-inch squares. Prefabricated Hessian was an asphalt-impregnated jute burlap material 36 or 43 inches wide and delivered in 300 foot rolls. If carefully laid down in overlapping strips over well-compressed soil, it provided a dust-free surface for fair-weather operations. The 368th Fighter Group flew P-47 Thunderbolts from the field until moving into central France in early September. The A-28 Pontorson Airfield was closed on 28 September. Today it can't be distinguished from the agricultural fields. 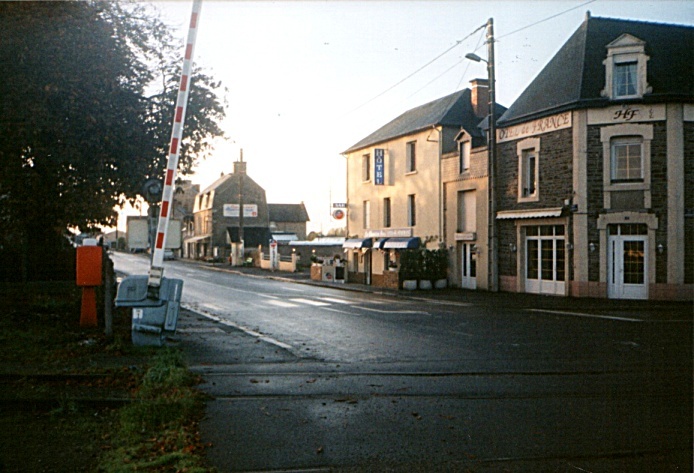 A French web site describes its location as 48.54547°N 1.49872°W, and its map indicates a location just off the D975 southeast of the center of town, about 800-1000 meters from the rail line. In the picture above I have just gotten off the train. I am about to cross the tracks on the D975 and walk to the hotel where I will stay, the Le Clarisse Bar Hôtel-Restaurant. It's the yellowish one with the vertical blue "HOTEL" sign. If you wanted to look for signs of the airfield, you would walk south about a kilometer past the hotel and look off the left side of the road. But today it's just an agricultural field with no sign of the temporary A-28 which was used for just seven weeks in 1944. I had a basic but nice room at the Le Clarisse Bar-Hôtel-Restaurant. 150 FF (or almost $21) got me a TV, sink, and bidet. 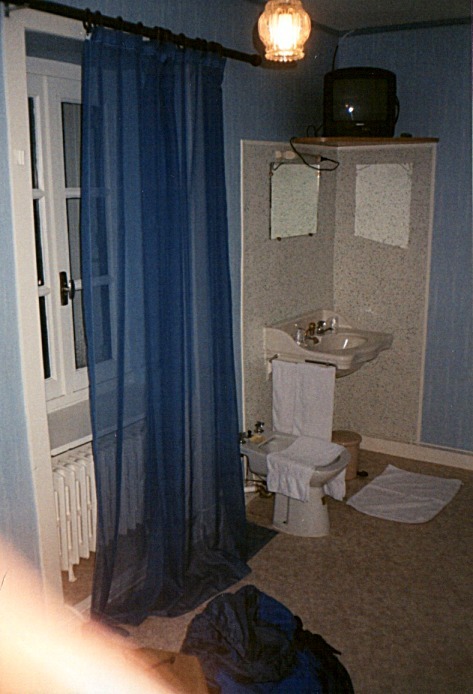 Low-cost French hotels are frequently upstairs from a restaurant and bar and have le toilette au couloir. That is, the toilet and shower are down the hall. 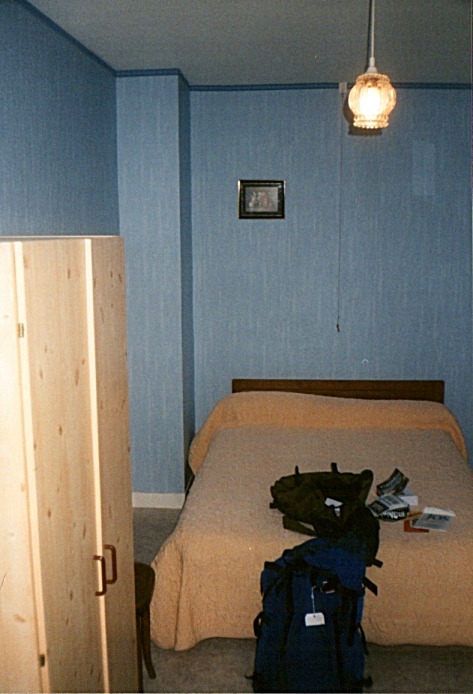 There are hostels in France, and one outside Pontorson is a typical example. They are often inconveniently located, and a bunk in one costs almost as much as a simple single room in the center of town. I've always stayed in the low-end hotels in France, with the exception of the Vertigo hostel in Marseille which blends the two concepts. Next we go to Mont-Saint-Michel. Or, if you want, you can go back to the start.